Both the women’s and men’s volleyball teams completed sweeps on the weekend to keep their successful seasons going. First up on Saturday was the women’s team going up against Sudbury’s Boreal Vipers. The first set consisted of multiple kills from the Hawks, as Boréal could only muster up eight points inbetween Humber’s dominant runs. The first set ended 25-8. Brandy Ferguson opened up the second set with four straight kills. Boréal called a timeout to come up with a new game plan, but Humber continued to control the set. Lauren Schneider had an eight-point serving run to end the second set, again 25-8 to the Hawks. Humber got out to an early 5-1 lead in the third set, the Vipers continued to struggle on the offensive end and could not respond. Aideena Wickstrom went on a six-point serving run, including two aces. Boréal narrowed the deficit, but Humber did not let up as they won the third set 25-13, and the match 3-0. Danielle Mills continues to get kills, as she had 10 in this game. Danae Campana had six digs. Humber’s hitting percentage was .393. They had 10 blocks, 24 digs, and 15 aces. 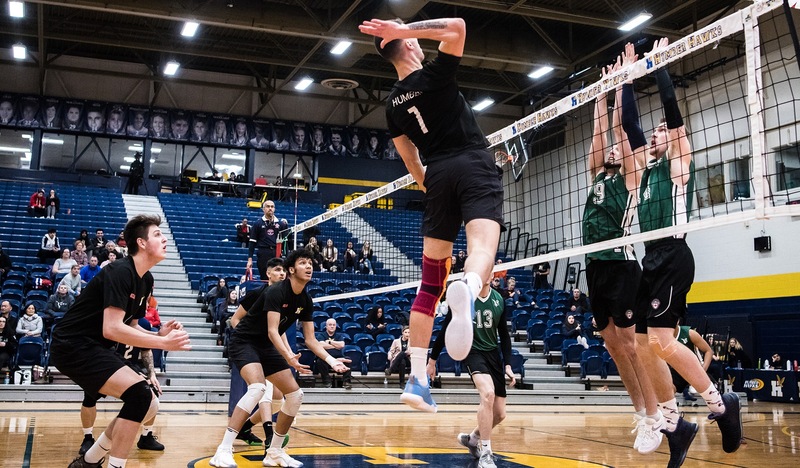 The men’s team also swept Boréal on Saturday, 3-0. Humber started the game with three consecutive kills, and setter Jake Gomes assisted on all three. The Hawks continued their execution of kills, which made the game 20-8 and forced the Vipers to call a timeout. The first set ended 25-12. Every player on Humber got minutes in the second set, as everyone put in maximum effort to try and push the game out of Boréal’s reach. They began making multiple errors, which then turned into another timeout. The Vipers continued to make unforced errors, which gave the second set to the Hawks, 25-18. The third and final set was similar to the second, as everyone continued to get minutes. The Hawks’ defense was very strong, and Boréal kept making unforced errors. The final play of the game was a missed serve on the Vipers side, giving the Hawks the 25-14 win in the set, and the 3-0 final win. Humber’s hitting percentage was .518, they also had 13 digs and 11 aces. The player of the game was Dylan Devecseri as he had 16 kills. The women’s team played their second and final game of the weekend on Sunday against Cambrian College. The first set started off with the Hawks going on a five point run, forcing the Golden Shield to call a timeout at 11-6. A second timeout was called at 16-9. The set ended 25-16. Cambrian came out strong in the second set, forcing Humber’s defense to struggle. The Golden Shield were just a point behind when middles Rossella Falcomer and Aideena Wickstrom nailed down multiple kills. Emma Heeney began serving as the Hawks scored six straight points, including two aces. Danae Campana came in and finished off the set with two aces, the set finished 25-16 again. The third set had both teams going back and forth, exchanging points. Both Humber and Cambrian could not go on a run of more than three points, keeping each other within close distance. Julia Watson then hit two kill to make it 16-12 and to force a Cambrian timeout. The Hawks kept their momentum going after the timeout and extended their lead to four. Campana’s serves continued to stymie the Golden Shield, and the game was ended with a kill from Falcomer, 25-20, and a 3-0 final. Humber had a .211 hitting percentage, 55 digs, and 13 aces. The men’s team was up next to face Cambrian. The Hawks got out to an early 6-2 lead, as Dylan Devecseri continued to make a name for himself in only his second game of the OCAA season. The Golden Shield were down 14-6 and called a timeout and fell further behind, losing 19-9. Errors piled up for Cambrian, as they eventually lost the set 25-14. John Obi started the second set with two blocks, Cambrian then evened the score at 4 apiece. Both teams stayed within a point of each other throughout the set, making for very entertaining rallies. Devecseri shifted momentum as he nailed down a kill on the left side. The Golden Shield had no response and lost the second set, 25-18. The Hawks got off to a fast start in the third set, as they went ahead 6-2, Cambrian then went on a serving run to tie the score up. Cambrian was behind 11-8 and called a timeout, Humber then extended their lead thanks to Devecseri and did not look back, as they did not let up on either offense or defense. They won the final set 25-17, and the game 3-0. Humber had a .354 hitting percentage, 19 digs, and 10 aces. Devecseri led the Hawks with 13 kills and eight digs. Both Humber’s men’s and women’s teams will travel to London to take on the Fanshawe Falcons on Saturday afternoon.